The Community Associations Institute, Heartland Chapter, has formally received an A+ rating to become an official Better Business Bureau Accredited Business, committing to embracing the BBB standards for ethical business behavior. 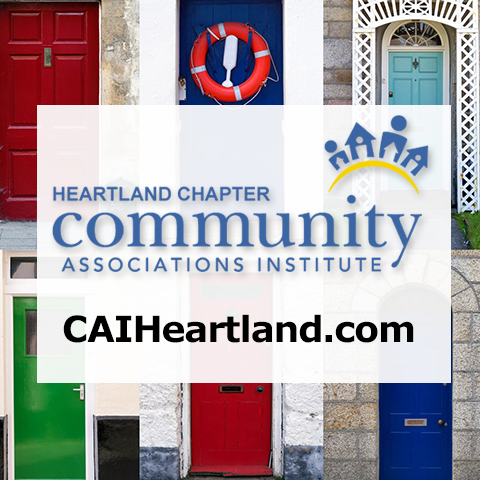 “We are pleased to be recognized as a company that upholds the highest standard of business conduct amongst our members and the communities and homeowners we serve,” stated CAI Heartland Executive Director, Cathy Roth-Johnson. The CAI Heartland Board of Directors adopted the values represented in the BBB Mission and Standards of Trust. We are incorporating this philosophy throughout the organization to further demonstrate our commitment to providing the very best to the homeowners we assist everyday. Being an accredited business through the BBB supports our goal of providing the best quality vendors that our communities and homeowners can depend on. This was not the first time that CAI Hartland and the BBB crossed paths. Our relationship was most recently strengthened when CAI Heartland Hall of Fame member and President of Rottler Pest and Lawns Solutions, Michael Rottler, was elected as the 2017 BBB Board Chair. “We are very proud of our members and honored to have them serving on prestigious boards within our community. We look forward to continuing our relationship with the BBB for many years to come” said CAI Board President, Tammie Sprinkle. BBB is a nonprofit, business-supported organization that sets and upholds high standards for fair and honest business behavior. All BBB services to consumers are free of charge. BBB provides objective advice, free BBB Business Profiles on more than 5.3 million businesses, 11,000 Charity Reviews, dispute resolution services, alerts and educational information on topics affecting marketplace trust. Please visit www.bbb.org for more information.